If you’ve never tried a real New York City bagel, then you haven’t lived. Or if Bruegger’s is your everything, you don’t know what you’re missing. Whether it’s in the water or in the dough, there’s something about the bagels in NYC that trump all the others. But just because NYC is the mecca for amazing bagels doesn’t mean they’re all the same. As a NYC tri-state area native, I’ve been a bagel snob my entire life. And lately, I’ve scoured the streets of Manhattan for the most mouth-watering bagels on the island. Know of a place I didn’t cover? Let me know, because the hunt for the best bagel never ends. 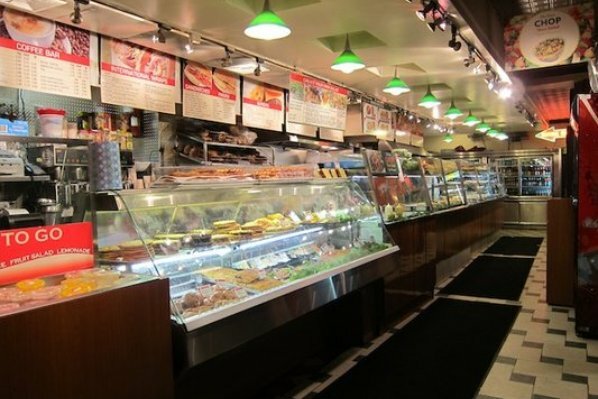 No matter the time of day or night, you can stop by Ray’s and always grab a bagel of your choice. Your bagel experience at this 24-hour shop located in the heart of the East Village varies depending on the time of day. 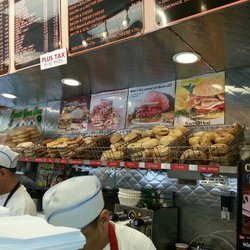 Since Ray’s must constantly be stacked with bagels, you might hit the jackpot and walk in immediately after a fresh batch was made. Or, you could get stuck with a harder, less fresh bagel if you’re a little unlucky. But more times than not, you will be putting a decent NYC bagel in your belly here. The bagels are huge and the egg & cheese sandwich is stacked. One major con: Ray’s consistently raises their prices, so don’t be surprised if your cost of breakfast starts trickling up over time. Going into this Kosher deli, I had high expectations. But, I was surprisingly disappointed with the bagel I received. 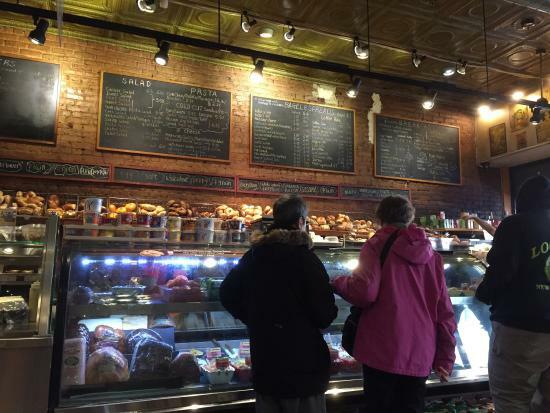 First, I found myself standing on my tip-toes, stretching my neck and even jumping up to see over the tall counter and iced coffee machines atop it so I could get a good look at the bagel selection. I typically like to scan all of my options, but ended up taking a safe gamble with an everything bagel after failing to see all the bagels. The selection of bagels at Bagel Boss, which I failed to see thanks to the super tall counter. The store also seemed unorganized, as multiple people asked me multiple times what I wanted, even after placing my order. The chaos and my frustration ensued as people who ordered after me got their bagels first. Finally, after a decent wait, the egg & cheese sandwich I ordered failed to impress. The bagel was toasted far too much, which made my bagel-eating experience crunchy and crumb-filled as opposed to fluffy and airy. The amount of ‘everything’ on my everything bagel was good, but didn’t make up for the rest of my experience. Only a few doors down from Bagel Boss, David’s Bagels completely blew me away. To be completely honest, when initially deciding between the two, I chose Bagel Boss and scoffed at David’s after realizing Bagel Boss is a Kosher deli. However, after my disappointing experience at Bagel Boss, when I tried David’s my faith in New York City bagels was restored. The basket of everything bagels at David’s Bagels. On a Saturday morning at 11am, the line at David’s wrapped around the entire store and out the front door. I braced myself for a long wait, but it surprised me how quickly and efficiently the staff kept the line moving. In five minutes, I placed my order and by the time I made it to the cash register, my bagel was ready. When I made it home three blocks away, my bagel was still steaming. My first bite felt like I sunk my teeth into a fluffy, egg and cheesy cloud. Egg and cheese was oozing from the sides and the bagel had the perfect ratio of ‘everything.’ On top of that, the price of my sandwich here was the cheapest of all my stops (only $3.50!). Pro tip: there is never a long line on weekday mornings, so if you can stop by then, do it. 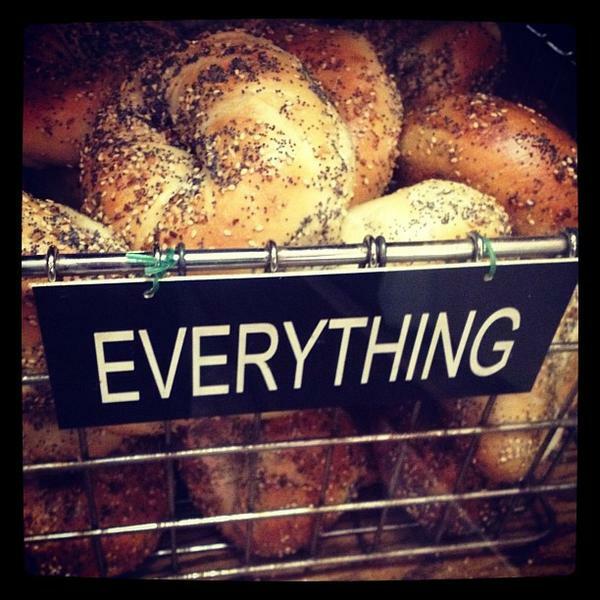 The baskets of bagels at Bagel Express are constantly refilled with fresh, hot bagels throughout the day. I tried many bagels in my 21 years of life, but nothing has yet to top foodgasm I experience every time I go to Bagel Express. The bagels at Bagel Express are unlike any bagels I ever eaten before. When I say they’re airy, they’re airy. When I say they’re fluffier than a cloud, I mean it. When I say after eating one of these bagels, I died and went to bagel heaven, it’s the truth. The bagels are never over-toasted, never over-cooked and never stale. The average size of one bagel is relative to the size of my face. During my time living on the Upper East, I went to Bagel Express almost every day, despite the fact they raised their breakfast sandwich prices by $1 after 11am. To me, it was worth it. 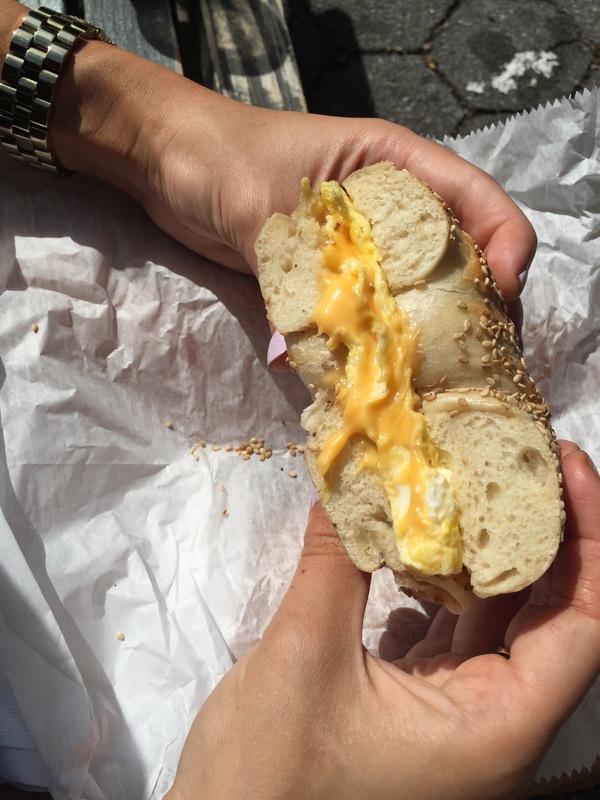 Any time I got an egg & cheese sandwich in the morning (I switched up bagel types, but everything remains my favorite), I would be comfortably full until after 6pm. It’s a bit of a hike to get up to this spot if y0u’re not from the area. 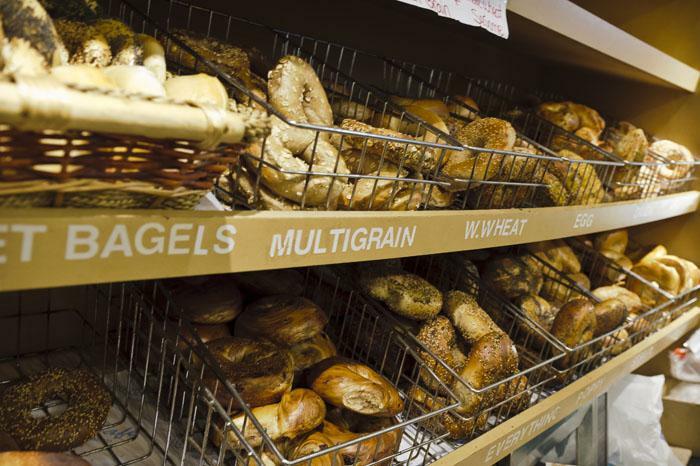 But once you try one of these bagels, you will never go back to any other bagel spot. Not long after trying Bagel Express, I turned my nose up to all the other bagel shops in the city. But after a few weeks, I knew I couldn’t stay so close-minded. I decided to venture out of my bagel comfort zone. Down the street from Bagel Express, I chose Bagels & More. The bagel selection was meager and the size of the bagels was significantly smaller than its other NYC counterparts. For a hot second, I wasn’t in the mood for egg & cheese, so I got an everything bagel toasted with butter instead. You can’t mess that up, right? Wrong. 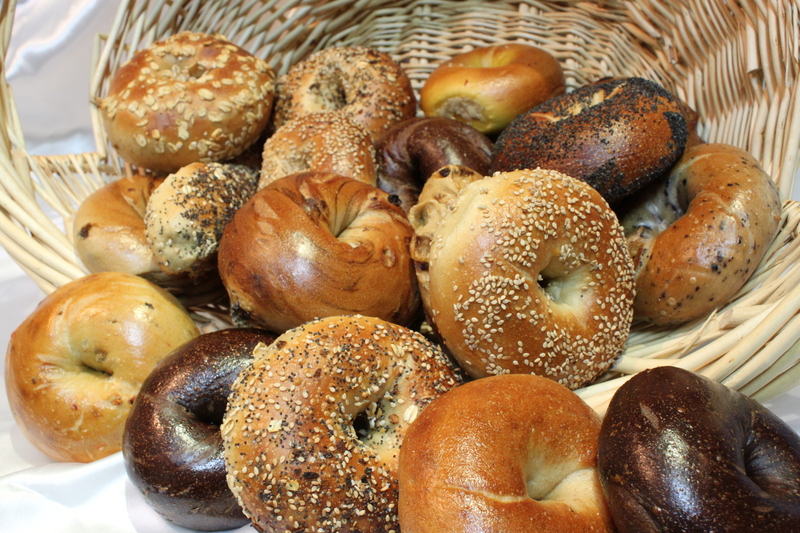 The selection of bagels from the Upper East Side’s Bagels & More. I’m going to go there and say this might be one of the worst bagels I’ve ever had in my life. Yes, even worse than Brueggers. Because at least Brueggers doesn’t char their bagels and hand you a dry rock. Upon unwrapping my bagel, I stood face to face with a super stale, coal black bagel with no density whatsoever. After one bite, I furrowed my eyebrows in confusion and opened up the bagel. Inside, half of the entire bagel was completely dry. Not to say I wanted my bagel soaking in butter, but whoever made it barely gave me one swipe. Off in the garbage it went. Needless to say, I’ve never gone back.